Great view!!!!! We want to spend more time there, just lay down on the balcony with the cool breeze. There are many facilities, card game, beers, coffee machines. For meal, we could find many restaurant neayby. This was our favorite stop on our Italy vacation! The Cinque Terre is an absolute must see. The location of The First was breathtaking, right at the opening to sea. The host was very accommodating. He met us at the train station and helped us with our bags. Our room had an issue with the lock before we arrived so it was not ready for us the first night... However the host told us a head of time and organized another room across the marina that ended up being a full suite! 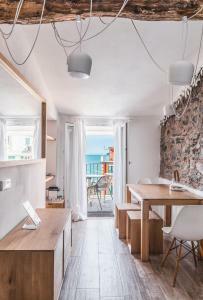 A story with it’s own kitchenette and balcony. We did not mind one bit! In fact the host met us the next morning to bring our bags to the other room for us. There are a LOT of stairs so be prepared. But as they say in the Cinque the more steps the better the view. The town is something out of storybook! We will definitely back. The apartment was exactly as advertised. Wonderfully Charming with stunning views, combined with its convenient location, make this the perfect getaway. Guianpietro was a wonderful and knowledgeable host and greeted us upon arrival. We highly recommend The First!! The apartment was small but nice and clean, The View was amazing! Doubt there is a better view in Riomaggiore. Laura met us at the train and walked us to the property. Pack light as its 50+ uneven stairs down from the Station and then 50+ STEEP steps up to apt. Climb is worth it as being on the Balcony is like the top of the World. Beds were comfortable, Wifi was good. Stunning view of the sea and beautiful pastel hued buildings from the balcony. Prime location. The location was amazing! We were given the room without the loft and it was roomy for 2 people. The property maybe the best location in Riomaggiore. 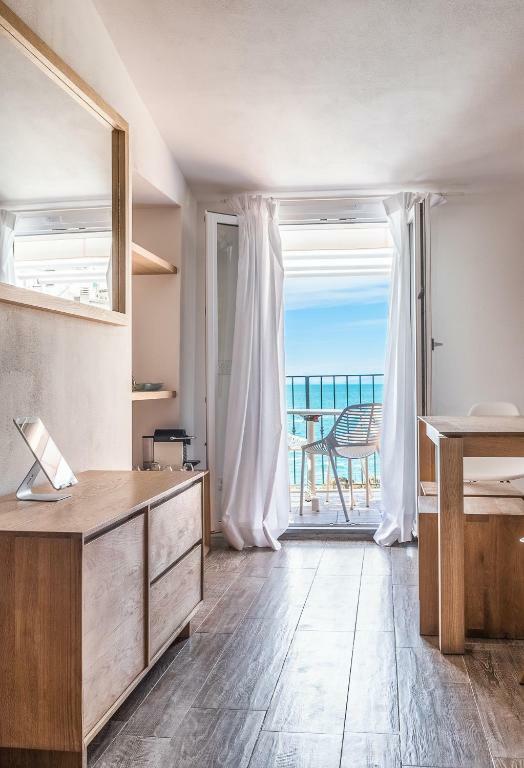 Just short of water side with the best view of the sea and swimming area including cliff diving and spectacular sunsets from the outdoor seating area on the 4th floor. Andrea the property manager is the best and cam through on a couple of un-scheduled issues and also made a very hard to get dinner reservation at prime time for my family!! The property and Andrea are tops in my book!! I truly think this was the best view in the city. The balcony is amazing. Room was very comfortable. Great beautiful place. Laura who checked us in was amazing and very helpful. She communicated about arrival and was loaded with great information. The bed was the most comfortable we have had on our entire trip. The room was beautiful and the views were incredible from the terrace. The town itself was my favorite amongst the five cities with a perfect view of the water. The nespresso in the room was very good and the perfect way to wake up for the day. There was a wine bar nearby with a great selection all made locally. The restaurants in town were very good as well as many options for cafes in the morning. We loved everything so much we extended our time an extra day and Laura was so helpful to accommodate the extra time. Overall, if you’re looking for a little bit of leisure during your travels this place is worth every penny. We will most certainly return and even check out some of their other properties opening later this year. Thank you again for a perfect experience! 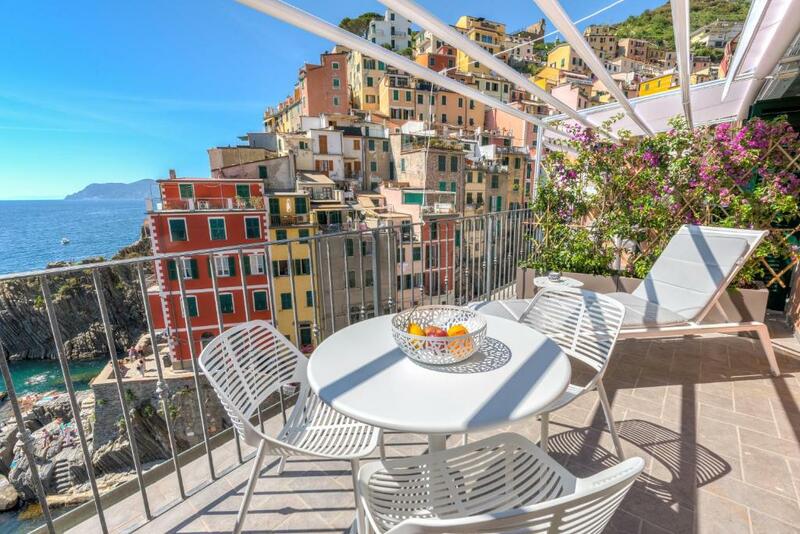 Lock in a great price for The First - Riomaggiore 5 Terre – rated 9.4 by recent guests! 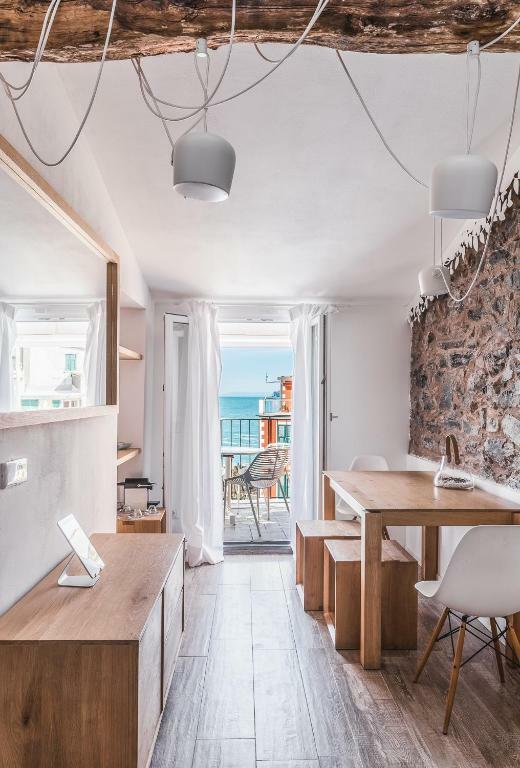 One of our top picks in Riomaggiore.Located in Riomaggiore, The First - Riomaggiore 5 Terre has accommodations with free WiFi, seating area and a kitchen. 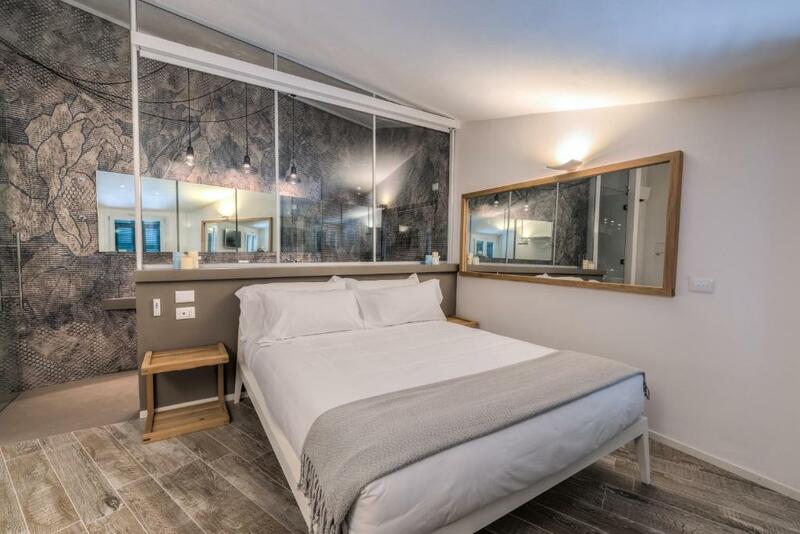 All units have a private bathroom and have air conditioning, a flat-screen TV and a fridge. A stovetop and coffee machine are also available. 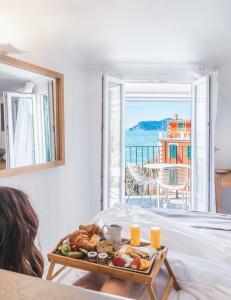 A continental or Italian breakfast is served at the property. La Spezia is 10 miles from The First - Riomaggiore 5 Terre. The nearest airport is Galileo Galilei Airport, 62 miles from the accommodation. 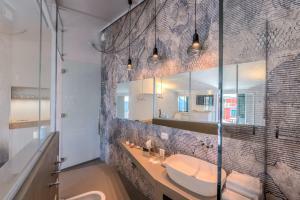 This property also has one of the top-rated locations in Riomaggiore! Guests are happier about it compared to other properties in the area. When would you like to stay at The First - Riomaggiore 5 Terre? This apartment has a flat-screen TV, electric kettle and dining area. "The First - Riomaggiore 5 Terre" Suites and Apartments is the perfect location to discover and enjoy 5 Terre, UNESCO WORLD HERITAGE Area and between the most charming places on Earth ! Both Apartment and Suite are furnished with care and provided with all comforts. Breathtaking view terraces from where you can enjoy the most beautiful sunsets you will ever see, steps away from the best restaurants in town and shops, Riomaggiore's Ferries Station and Train Station with connections between the 4 other Villages all day long. We offer a special and unique "Private Personal Concierge Service" to all of our Guests. 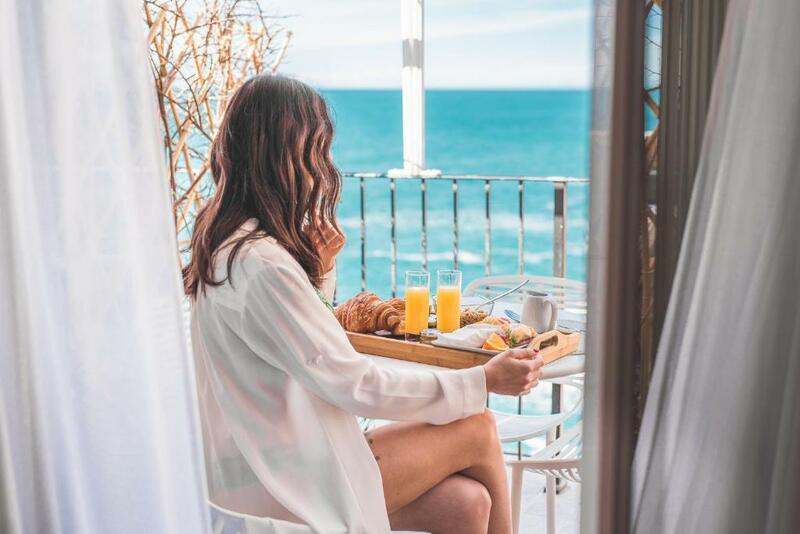 Your "Personal Concierge" will take care about your Restaurant Reservations and everything you might need, in order to make your holiday an unforgettable one ! To us "Home is not a Place, it's a Feeling" and let you feel "Home" is one of our first goals ! Hi ! Francesco here, your Host ! Me or one of my "Personal Concierge" Staff will always be there to welcome you and take care about all of your requests ! Riomaggiore, the first of the five villages composing the 5 terre, Unesco World Heritage. An amazing place, for an unforgettable exquisite experience ! House Rules The First - Riomaggiore 5 Terre takes special requests – add in the next step! The stairs are steep and narrow. Walking up and down many times can cause the muscle cramping. If you are carrying a luggage or have any walking difficulties .... there are A LOT of stairs and very steep! The view is really very nice. We enjoyed it all. The steps up to the room were a bit to climb, however we like exercise. The view was great. Perfect location and would definitely stay here again. Laura was a great contact, she met us as we arrived on the train keeping in contact with us the entire day. Laura answered questions and handled everything promptly. The room was exceptionally clean. The suite was clean, comfortable and amazing views. The location speaks for itself, just look at the pictures. The apartment is also lovely. Andrea is a great host, he welcomed us from the station, helped with our bags up 'those' steps and booked a restaurant for our first night. He was always available to help, top marks Andrea. Location and the friendly Laura picking us up from the station. Great communication too. Dirty and oily floor on the shower. This is not a luxury suite. It is practically an Airbnb type rental. There is no concierge on site, you get a guide who greets you at the train station who hands you the key card to the apartment and show you a few things but anytime you need anything, you will need to message the guide. You also need to have a working phone to coordinate your arrival time since there is no concierge on site. 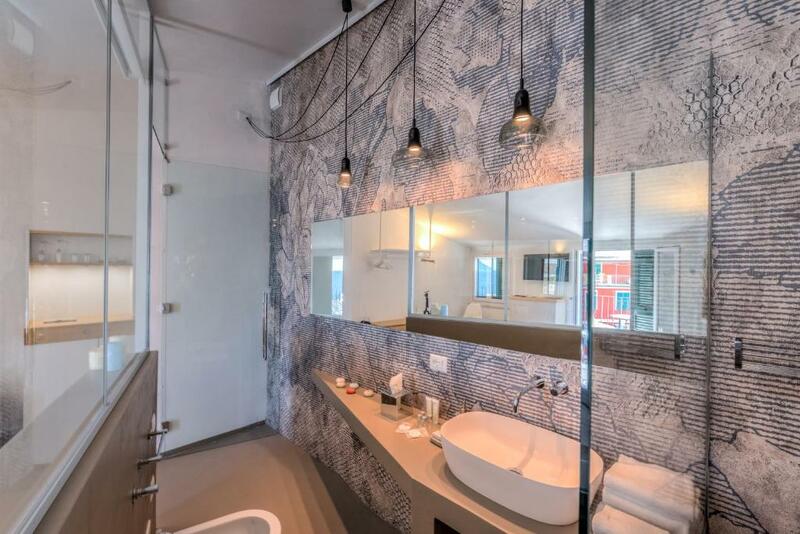 The suite is built in an old apartment building with with narrow, steep, uneven stairs. It is the price you pay for the stunning view. The lights are quite dim and it can be quite dangerous going up and down the stairs. There is rope for support but no hand rails. We had a hard time carrying our luggages up the stairs and resorted to paying Roberto 5€/bag to carry our luggages when we checked out. We accidentally turned on the ventilating fan at midnight and also triggered an alarm outside the room and could not figure out how to turn either of those off. The switches are quite confusing. If there’s no one on site, we recommend the property to provide written instructions for guests since we could not get a hold of our guide when we needed assistance. For the price, you are really just paying for the view and location. Please manage your expectations. You will need to check properly which room you are getting especially if there is more than two of you. 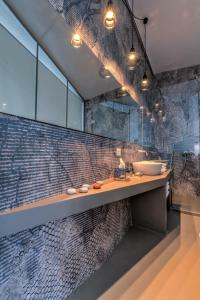 The pictures shown are cumulative of all the rooms they provide. We ended up with a small room (not the loft with the stairs) which was adequate for two of us but it is very small. The honeymoon suite is located on the top floor of 4 flights of steps. There is no other way to get there. Andrea helped us with our bags. We felt sorry for him because they all weighed about 20kg and there was 3 of us. My husband took one up but it was a bit of a mission. I would make sure that next time we pack a lot lighter. We had a pullout bed for my daughter but really the room is quite small with the pullout bed. These are only minor things. We really loved the room and the place and Andrea could not make us feel more welcome or be more helpful. We only spent one night at Riomaggiore 5 Terre which was a shame. It was an amazing place and I wish we could have stayed longer. Our host Andrea was amazing. He helped us with our bags which was a huge task. He suggested we make a dinner reservation at a nearby restaurant to see the sun set. Which we did and the food and the view was fantastic. Our room was great. You could hear the ocean and the view was wonderful. It was so relaxing to sit on the balcony and take in the sun, the sound of the ocean and the view. We would love to come back.